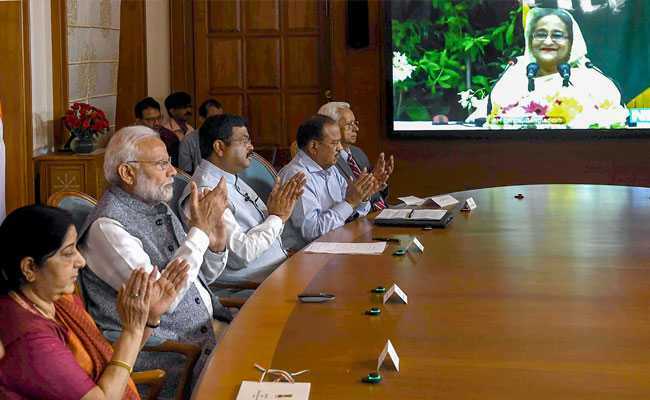 Prime Minister Narendra Modi and his Bangladeshi counterpart Sheikh Hasina jointly launched the construction of India-Bangladesh Friendship Product Pipeline Project through video conferencing. It is first such pipeline through which refined diesel will be supplied to Bangladesh from India. The project involves construction of a 130-kilometre long pipeline that will connect Siliguri in West Bengal and Parbatipur in Dinajpur district of Bangladesh. Of the total stretch, six-kilometre will be in Indian side and remaining 124 kilometres will in Bangladesh. Indian leg of the pipeline project will be implemented by Assam-based Numaligarh Refinery Limited and Bangladeshi leg will be implemented by Bangladesh Petroleum Corporation. The pipeline has capacity of 1 million metric tons per annum. It will supply refined diesel to Parbatipur depot from Numaligarh of Assam in India. Initially, it will supply Bangladesh 2.5 lakh tonnes of diesel every year and gradually it will be increased to 4 lakh tonnes. The project will replace existing practice of sending diesel by rail covering distance of 510 kilometers. The estimated cost of this pipeline project is Rs. 346 crore and it will be completed in 30 months' timeframe. Q. 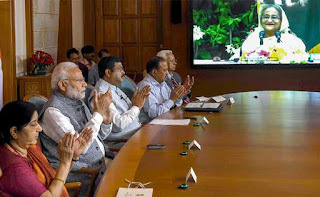 Prime Minister Narendra Modi and his Bangladeshi counterpart Sheikh Hasina jointly launched the construction of which project through video conferencing?